Israel declares de facto the unchallenged air and electronic warfare superiority in the Middle East as the regional superpower: the practical response in action as the demonstrative backdrop to Munich Security Conference 2018. It is also, possibly, an allusion and the reference to Russia’s long-standing pretensions and aspirations as “The Third Rome“. As the Editor of “Debkafile”, Yuri Shamis put it in this BBC interview, it is “the real situation on the ground”, that’s what matters. It appears to be complex, multi-level, involves a number of players, fluid, open to various interpretations, so far adequately controlled by the major (principle) geopolitical forces, unpredictable, and the focus of the intense observations. Israel’s prime minister launches a stinging attack on Iran, telling a security conference in Munich the country is the “greatest threat to our world”. Benjamin Netanyahu said Israel would “not allow Iran’s regime to put a noose of terror around our neck”. Also in the programme: a large fire at the most important shrine in Tibetan Buddhism; and is Iceland about to be the first country to ban male circumcision? Picture: Israel’s prime minister Benjamin Netanyahu. Credit: Thomas Kienzle/AFP/Getty Images. Munich Security Conference 2018. Prime Minister of Israel Benjamin Netanyahu speech at the Munich Security Conference. Signaling a business-as-usual attitude in the face of significant legal woes, Prime Minister Benjamin Netanyahu adressed the Munich Security Conference Sunday morning, just days after the police recommended he be indicted for bribery, fraud and breach of trust. This was the second high-profile conference Netanyahu has attended in less than a month, having gone in January to Davos for the economic summit there. Zarif was present at the weekend conference. “Israel will not allow the regime to put a noose of terror around our neck. We will act if necessary not just against Iran’s proxies but against Iran itself,” he warned. <a href=”http://Jpost.com” rel=”nofollow”>Jpost.com</a> staff contributed to this report. mikenova shared this story from iran aseman airlines – Google News. mikenova shared this story from Semirom Iran – Google News. The ATR 72, a twin-engine turboprop operated by Aseman Airlines, crashed due to bad weather into the Dena Mountain near the town of Semirom, an official at the Iranian carrier confirmed to the media. … A passenger plane crashed in central Iran on Sunday killing all 66 people on board, authorities said. Is Russia’s Containment Still Possible? The new US national security strategy defines Russia as a power challenging American influence and attempting to erode American security, and … with such autocratic regimes in other parts of the world — Pakistan, Egypt, Middle East monarchies, as well as some countries from Latin America and Africa. Munich Security Conference 2018. National Security Advisor H.R. McMaster speech. Feb 17, 2018.
mikenova shared this story from Munich Security Conference 2018 – Google News. mikenova shared this story from iran – Google News. The use of the word “monitor” in the identifications used by the technical compliance advisor (TCA, for its acronym in English) Arnaldo Claudio , in addition to his work team, caused yesterday the most recent clash between the government of Puerto Rico and This official of the Federal Court. Hours after Justice Secretary Wanda Vázquez and part of her work team signed a motion asking Judge Gustavo Gelpí to remove the word “monitor” from the IDs, the judge declared that the petition did not take place. “The ACT, in fact, will monitor this court, as well as its advisory capacity, particularly in the training phase (of the Police Reform) that concludes in the fall.The TCA and its team are federal monitors and their identifications reflect it” , reads part of Gelpi’s order. “Because it is under the orders of this court and its supervision, from this perspective is the monitor of this court,” continues Gelpi, who points out that it is not until now that the Commonwealth of Puerto Rico objects to the use of the term monitor when referring to Claudio. “From the perspective of this court, both terms (TCA and monitor) are synonymous,” Gelpi said. “The court makes its identifications as best understood, in the same way that the Puerto Rico Police draws up theirs. Earlier yesterday, Justice argued that the TCA, that is, Claudio, measures compliance and that it is not a monitor. “The plaintiff and the defendant (in the Police Reform) agreed in the consent agreement to use the word (phrase) Compliance Technical Advisor instead of the word monitor, even though this afternoon it decides that TCA and monitor are synonymous, subject that the Commonwealth of Puerto Rico rejects, it is necessary that the credential of the TCA be consistent with the agreement “, reads the motion of Justice. In the government document, he argues that the word “monitor” is not part of the TCA definition that appears in the agreement. “In addition, the agreement establishes that the TCA will only have tasks, responsibilities and the authority conferred by the agreement. The TCA will not be able to replace or assume the roles and duties of the Puerto Rico Police,” reads part of the motion. 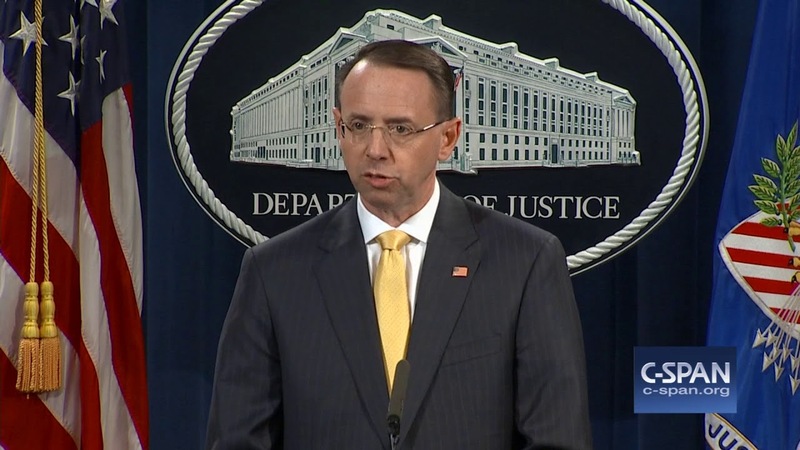 mikenova shared this story from rosenstein doj russians – Google News. Allegations that Moscow ran a hidden multimillion dollar troll campaign using social media to try to to sway the 2016 presidential election are “blabber”, Russia’s foreign minister has said. Sergey Lavrov on Saturday dismissed the extraordinary US indictment released on Friday that accused 13 Russians of an elaborate plot aimed in part at helping Republican Donald Trump defeat Democrat Hillary Clinton. Mr Lavrov told a high level audience of policiticians and security officials at the Munich Security Conference that he had “no response” to the accusations levelled by US special counsel Robert Mueller.